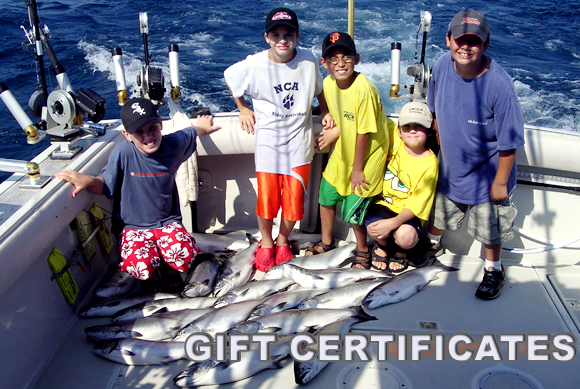 Captain Bob’s Lake Michigan Charter Fishing Charters makes it easy for you to purchase a gift for a friend or family member. All you have to do is follow the directions below. First you must determine what you want to give. A Charter rate starts at $475.00 for a weekday 5 hour 2 person Economy Charter out of Northpoint Marina. The prices range on up to $950.00 for an FULL DAY 6 person charter in Montrose Harbor , Chicago. A gift certificate can be made out for any amount and the recipient could use it toward his share of a trip also. Purchase can be made by credit card or check over the phone. I will then send you a color gift certificate promptly (Email could be done the same day)! One great thing is that these certificates never expire until used.